Booragoon JFC Under 15s Player Brittaney Gonsalves made it into the news this week after an excellent first season. YANGEBUP resident Brittaney Gonsalves was not a football fan before taking it up earlier this year, but it does not appear to be holding her back. The 14-year-old scooped the Booragoon Junior Football Club’s Under-15s fairest and best award after following friends to the club for season 2016. It was not the only win for the defender, who was also invited to a number of talent identification days run in the lead up to the new AFL women’s league. She is too young to be drafted at this stage but said she was enjoying the opportunities. “I’ve heard about what scouts are looking for, research into opposition players, what food professional players eat and how they prepare for matches,” she said. This is my second year coaching at Booragoon Bulldogs Junior Football Club from the inaugural Under 12s team in 2015 to coaching the inaugural Under 15s team in 2016. Our season consisted of 14 rounds playing each opposition team in our conference 3 times. We were by far the youngest group of girls in the competition with ages ranging from 11 to 15 years. We had a huge variety of abilities from girls returning from playing Under 12s in 2015 to girls playing their first team and/or contact sport ever. We had a pretty rough season on the scoreboard but it most certainly didn’t reflect on how the girls played each and every week. Unfortunately we weren’t able to get a win on the board but we held our own, stuck to our structures and there were certainly some worried faces over at the opposition’s bench midway through the season. We had a rough run with injuries throughout the season from various broken bones to concussions which took its toll on the girls having to run the games out without a bench. The whole team has improved out of sight as the season progressed and it really showed when we came up against the tougher team’s really putting pressure on them late in the last half of each game. The girls played in the 2016 Girls Gala event hosted by Peel District held in Rockingham. Fantastic effort by all the girls on the night, but outstanding efforts of sportsmanship and consistency from Mya and Jessica who were our MVP’s for the event. A big thank you to Anthony Doig – President for coming down and taking on the role of coach even though he thought he would run water. We had the East Fremantle Youth girls team and coach come down to run a training session with both the Under 12s and Under 15s which gave them a good insight of what to expect when they play in the youth girls competition. They had an absolute ball and definitely gained a lot of skills and game awareness that they could then use in their own game. We were invited to the Booragoon Bulldogs Fairest and Best Awards Night as this was the first year of Under 15 Girls. It was an exciting night and the girls made an impact. Britt took out Fairest and Best Player with a tight Runner Up of Monique with Bronte and Chloe H literally one point behind. Team Awards, notably Most Improved was Lili who had never played a contact sport before. Coaches Award was Bronte who put in 110% in all games even with having hits to the head in a couple of games but still wanted to get back on play. Best Clubman was Amalea who recruited players for the team, introduced everyone at the first couple of training sessions and kept up the team morale. A huge congratulations to Amalea, Britt, Bronte, Chloe D, Chloe H, Jess, Mille, Monique and Tyler who were invited to the Junior Female Talent Testing on Thursday 8th September at Atwell Reserve. Successful players will be offered a place in the 2017 WAFC Female Development Squad as a part of preparing for the National Women’s AFL competition. We definitely had a few stand outs from the Booragoon Bulldogs! Big thanks go to all the parents for their assistance with special mention to Jeff Hogg for stepping in and coaching throughout the season when I wasn’t available, to Garth Lawrence and Erin Clarke out First Aid Officers that were kept very busy at most games and to Ruthy the unofficial team photographer. Lastly to Lee Lawrence our Team Manager for all the hard work she did, couldn’t have done it without her. Are you interested in playing AFL Football? Are you keen to represent Western Australia? If you answered “yes” to these three questions, then you should try out for the 2016 State Schoolgirls AFL Team. To nominate, go to the School Sports WA web site, click Nomination, and fill in your details. For more details, please contact the Head Coach Oliver Beath on 0411 018 939 or at oliver.beath@allsaints.wa.edu.au. 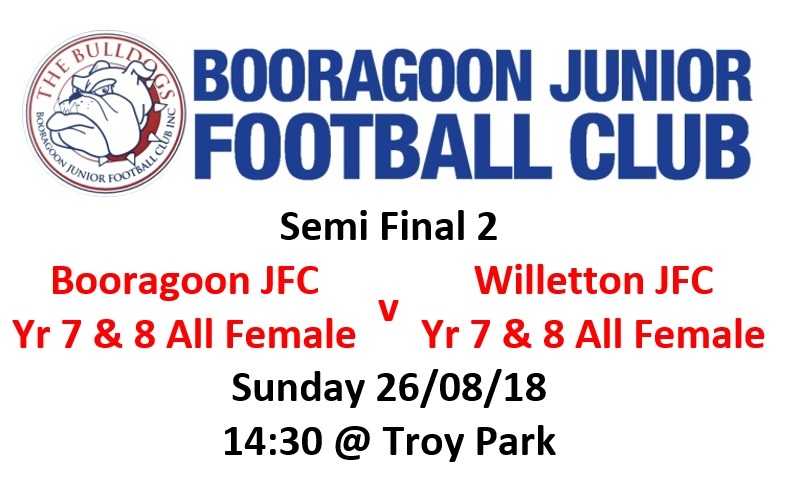 Booragoon JFC will have a Under 15s Girls team playing football in the 2016 season (and beyond).